Ye Old Waggin-eth Trail Bike Ride-eth (Yea, my King James english needs a bit of work) -- but anyway, Waggin Trail Bike Ride 2019 is gonna be here sooner than you think. It is Saturday, May 4th (first Saturday in May). On-line registration is available at active.com or you can download a printable registration form here. Everyone who registers by April 15th will receive a free T-shirt, so be sure and mark your T-shirt size on the registration form. Early registration (online prior to the event) is $30.00 for adults and $15.00 for children under 12 (accompanied by an adult). Registration after April 15th and the day of the event is $35.00 for adults and $20.00 for Children under 12 (accompanied by an adult). So save a little money and register early. Please check by this website periodically for route updates, etc. regards the ride. 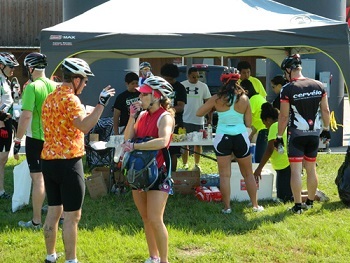 This year we will have breakfast burritos available before the ride (by donation) and the usual hamburgers/hotdogs and fixins available after the ride. 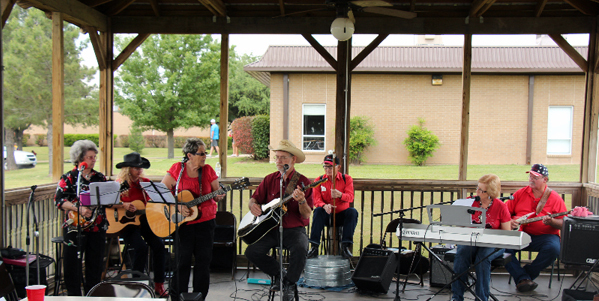 Hope to see you (and bring a riding buddy or two with you) at the Waggin Trail Bike Ride 2019, Saturday, May 4th. Folks, we have the same issue this year as last. 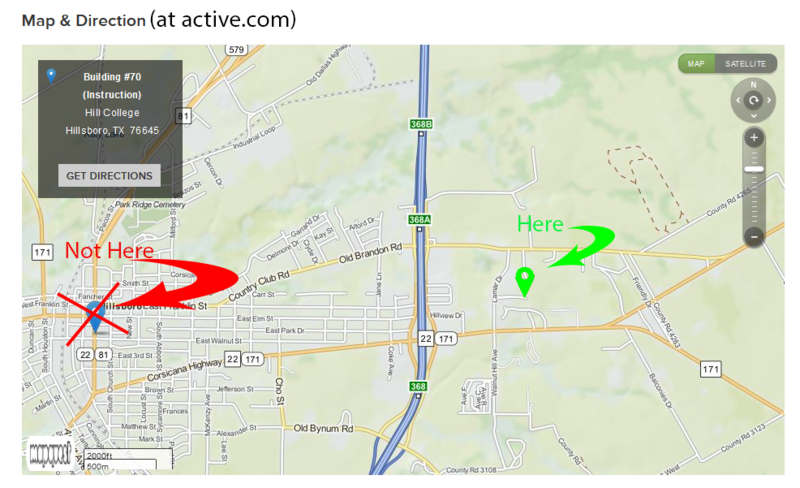 The direction map generated at the Active.com registration website plots the start location incorrectly. I have spoken with Active and they assure me they will get it fixed this year. 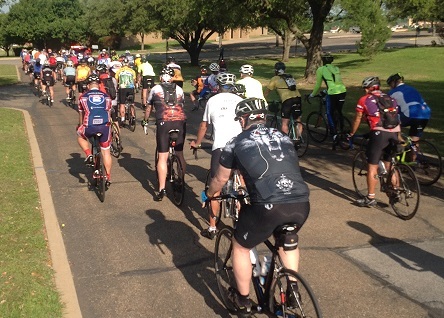 Just to be clear, the start/finish point is the same as last year - Lamar Dr., Hill College, Hillsboro, TX 76645. All the maps on this website have the correct location for the start/finish. See you on Saturday, May 7th. Below is the sponor banner for this year's Waggin' Trail Bike Ride. We had more sponsors this year than in any previous year. 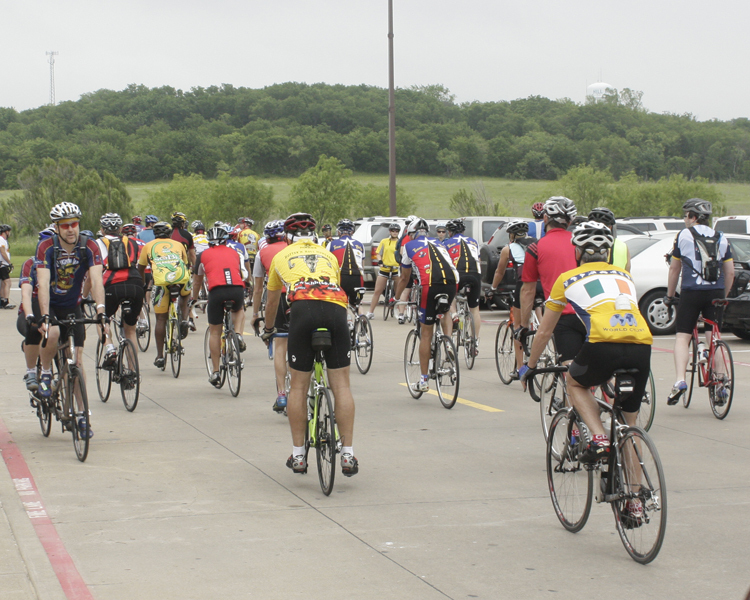 Thank you Hill County for your outstanding community support and we look forward to next year's ride - Saturday, May 7th. 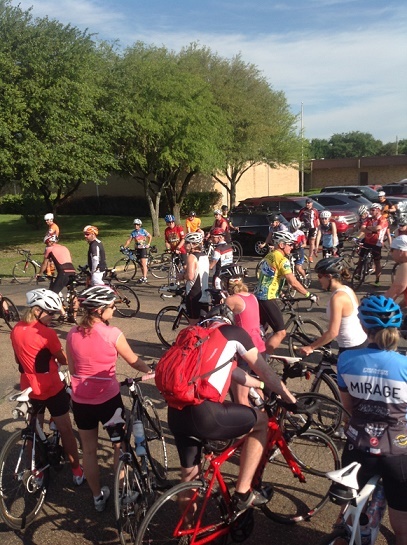 Thanks everyone (volunteers and riders) for making this year's Waggin Trail a hugh success. We have received many complliments about all aspects of the ride, as well as some good constructive critizism (that we'll comment on later) that will help us improve the ride for next year. Thanks to Betty Hendricks for manning the registration (which went extremely well, according to the feedback from the riders) as well as all the SAG workers. The ride was well supported with support. Several folks had mechanical problems (mostly flat tires) and were picked up quickly by SAG support. All the rest stops were manned well, setup ontime, and ready to go when the ride started. Thank you everyone who worked our numerous rest stops. 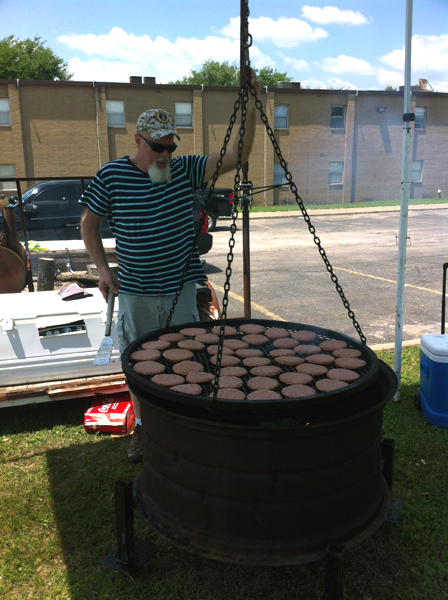 Needless to say, the hamburgers/hotdogs and live entertainment (band) was a big success and we can't thank David and Carol Huens (provided the hamburgers/hotdogs), Terry Martin (who provided the awesome grill), Deborah Dezendorf (who arranged the band), Dave Mojica, Lynelle Sparks, and Natasha Sawyer (Explorers and Sesame Club who cooked and served) enough for their contribution. 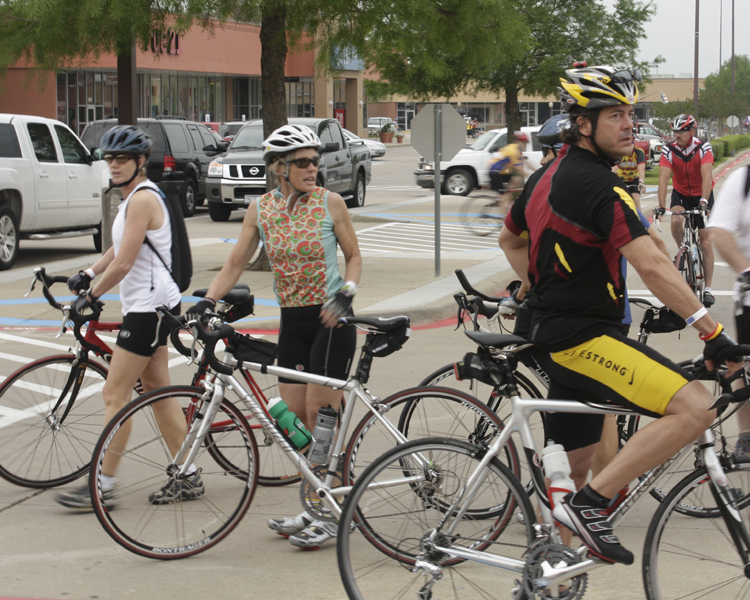 We had several photographers out and about during the ride and will post pictures here on the website soon. But here are some to enjoy now. Well it's that time of year again. Spring is coming and so is the 8th Annual Waggin trail Bike Ride. 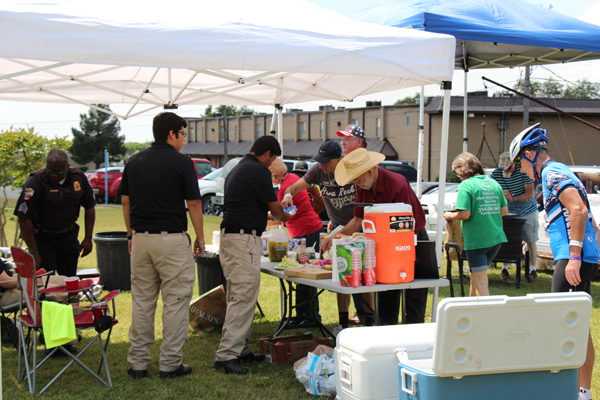 This year's event will be Saturday, May 2nd, 2015. Everyone who registers by April 15th will receive a free T-shirt, so be sure and mark your T-shirt size on the registartion form. Early registration (online prior to the event) is $25.00 for adults and $15.00 for children under 12 (accompanied by an adult). Registration at the event is $30.00 for adults and $20.00 for Children under 12 (accompanied by an adult). So save a little money and register early. Please check by the website periodically for route updates, etc. regards the ride. 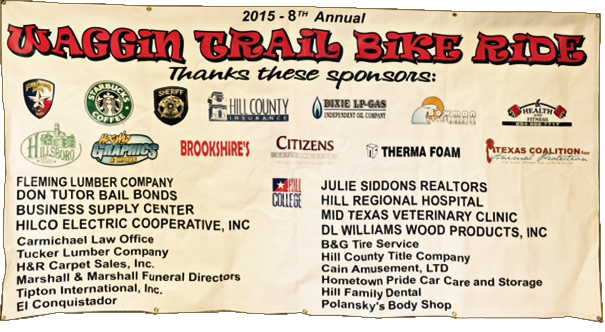 Hope to see you at the Waggin Trail Bike Ride 2015, Saturday, May 2nd. OK everone, it almost time for Waggin Trail Bike Ride. The weather forecast looks great and I just road the route this morning and the road surface is good - no chip/seal this year on any route. Also, we have coordinated with R&R Fitnest Center here in Hillsboro for use of their shower facilities after you finish the ride. So showers will be available at R&R Fitness ( 110 E Franklin St, Hillsboro, TX, 76645 - just one block east of the Hillsboro square) until 4pm on Saturday. Look forward to seeing everyone this Saturday, May 3rd for the 7th Annual Waggin Trail Bike Ride. OK. It's that time of year again to start thinking about Spring "Cycling Events". Waggin Trail Bike Ride 2012 is scheduled for 5 May, 2012 and it's already looking to be as exciting and enjoyable as in previous years. 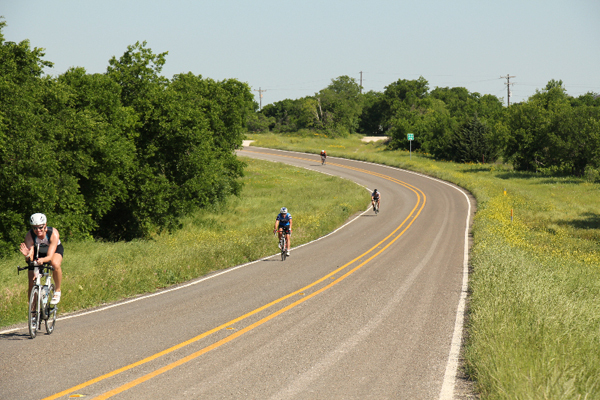 Hill County has some of the best Farm to Market (FM) roads in all of central Texas. This year we are planning on 5 routes - 100, 68, 40, 26, and 8 mile routes. 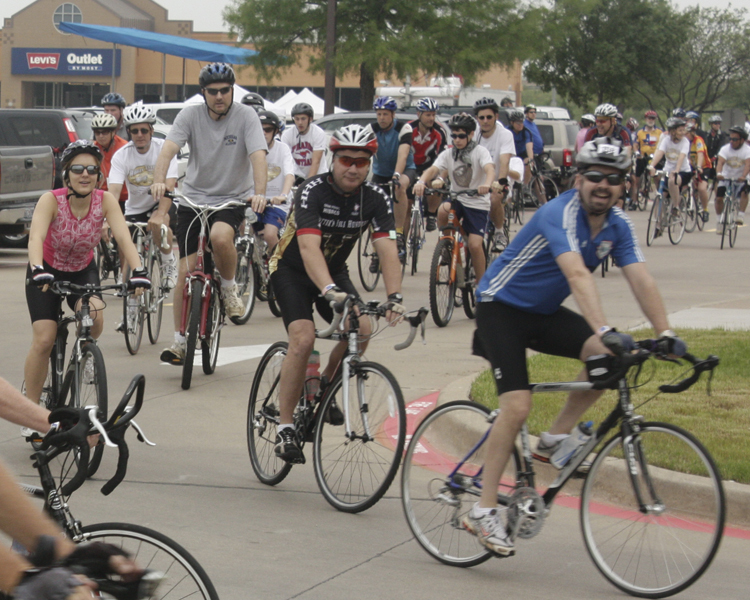 So mark your calendars for Saturday, May 5th, 2012 for an exciting, fun day of great cycling and exercise!! !